One of the challenges of doing inbound marketing and content marketing well is “feeding the beast.” The old newspaper term refers to the foreboding feeling editors get when they’re staring down a blank front page. Every business wants to be a thought leader, to have an impressive online presence updated regularly with a wide variety of killer content. Generating that content, to riff on the saying, can be a beast. Here’s the thing. If you’re already producing great content for your company website, blog, and social media channels, marketing on Medium will be a breeze. Medium is part blogging platform, part social network, and part personalized curated content based on user interests and actions (like YouTube). Users get a few articles a month for free, or can opt for unlimited with a $5 a month subscription. They can curate content by adding areas of interest or following writers, friends, or publications they like. Users also get recommendations from the Medium editors on the home page and in emails, usually stories with a high number of recommendations, claps (think likes), and reader completions, regardless of when they’ve been posted. This algorithm is meant to show people the highest-quality, most captivating and interesting reads. An added bonus: Medium tells you not only how many people clicked on the post, but how many people actually read it. Medium is a place to amplify your brand’s voice and to reach people interested in your industry that you’ve yet to reach through other inbound efforts. When you boil it down, it’s a way to get your content to go farther and work harder for you. According to SimilarWeb, Medium has 86 million unique monthly users and 182 million monthly visits. The average visit duration is about two minutes with a bounce rate of 56 percent. The audience skews younger (think under 50) and the most popular topics are technology, design, marketing, life learning, business, entrepreneurship, startups, culture and politics. Chances are your business has some content it could add to the conversation in one of these areas, right? What makes Medium standout is that it’s all about good storytelling. There is no advertising, no fake followers, and no spam. The clean design, interesting content, and absence of click-baity headlines makes Medium feel like an internet palate cleanser. It’s what users like about the platform. If you’re company starts posting content that breaks these unspoken rules, it will not perform well. Remember, the highest rankings go to the most read and recommended posts, not just those by the most famous author or with the most keywords. Medium is for building thought leadership and brand authority in your industry. It’s about demand generation more than lead generation. The content you post to Medium should first and foremost provide value to readers’ lives. That’s what we’re all here for right? When you decide to launch a Medium account for your business, make sure to use your business name and branding on your profile, including a link to your homepage in the bio. Next connect your business Twitter account. By doing this, your Twitter followers become part of your Medium network. You have the option to add a Facebook account too, but Medium only connects with personal accounts, not business pages. Now that you’re up and running, it’s time to start posting. Some companies take content from their blog and simply repost to Medium. Others post some blog posts, infographics, videos, and other content, selecting only the best stuff. 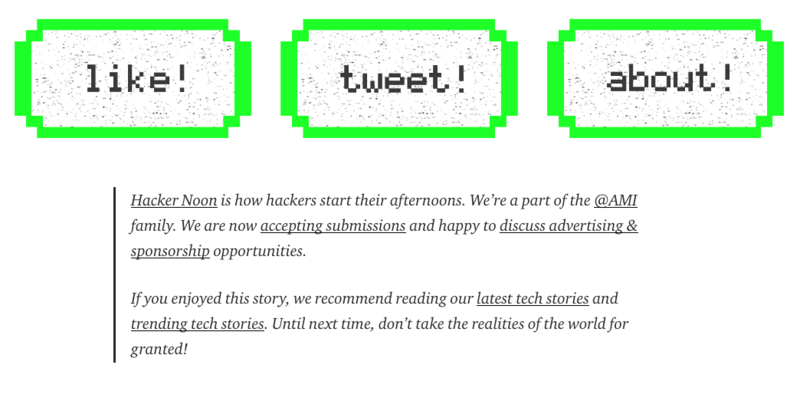 Another option is to post a snippet of each post on Medium, linking back to the full post on your website or blog. 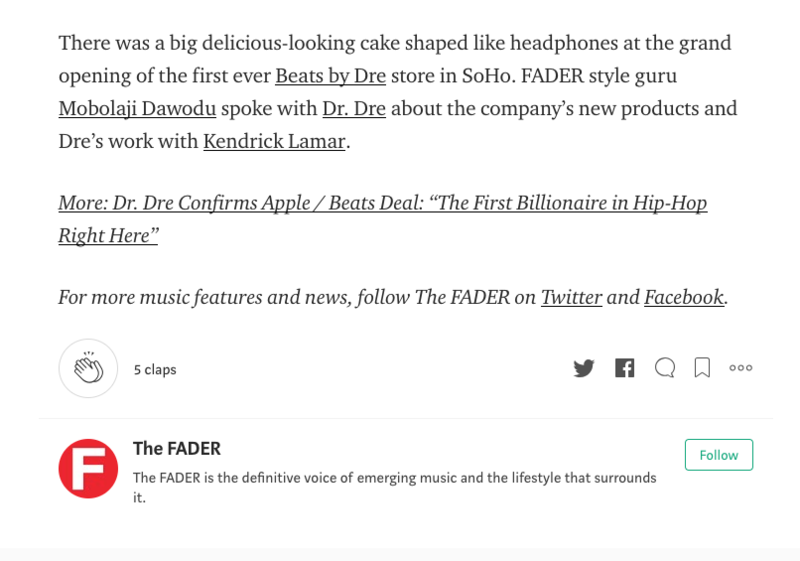 The music magazine The FADER does this, teasing its best articles on Medium. While this drives traffic to your site, people sent away from your Medium post are unlikely to return to clap or recommend the story, which won’t get you much in terms of boosting your article on the platform. Some companies opt to tweak existing content or post completely new content targeted to a specific Medium audience. While this is more work for your marketing team, it allows you to create content that is laser-focused on the storytelling, not the keywords. But Medium isn’t supposed to be for lead generation, right? Sort of. You do not want to sound like a sales pitch, but it’s also acceptable to ask readers for recommendations or to visit your site for more content or a free download. 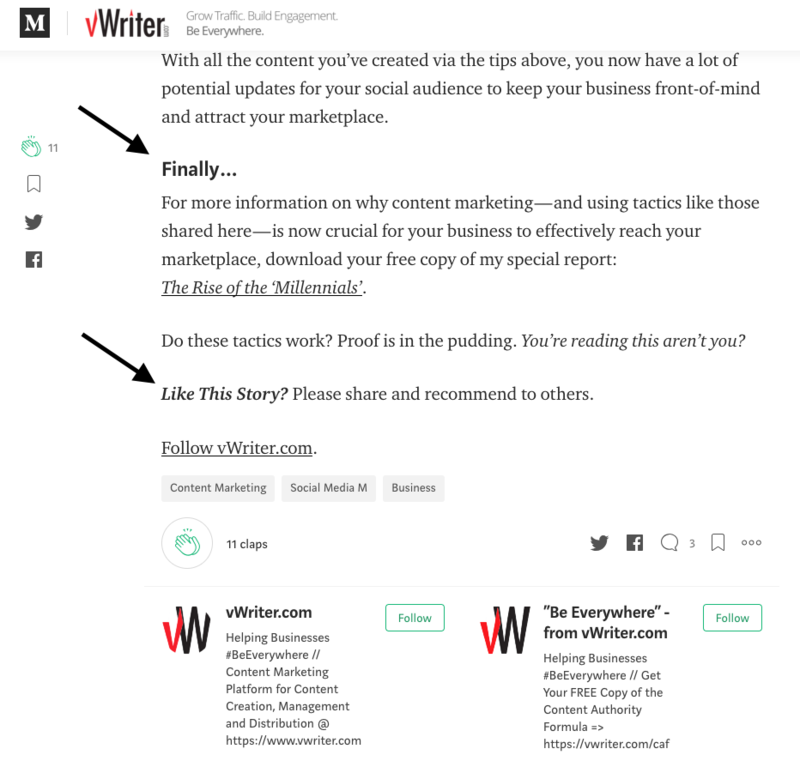 Check out what vWriter added to the bottom of this Medium post. He tells readers they can get more content by downloading his special report (which requires filling out a form on his site) and then he asks people to share and recommend his story, boosting its reach. There’s also this creative collection of CTAs published by Hacker Noon. This is a softer sell than vWriter, asking for social engagement and inviting people to read more of the community’s content. Plus it’s cool branding. Medium knows we all want to see how our posts are performing. By clicking on “Stats” in the left-hand sidebar, you can see the number of followers, how many accounts you’re following, and the total number of post views, reads, and recommendations over the past 30 days. Hover over a date and get that day’s numbers. Views are defined on Medium as the number of people who have looked at a post. Reads represents the number of people who read the entire story. The “Read ratio” is the difference between your reads and views, giving you metrics unique to Medium. Not only do you know how many people read the entire article, but you can also learn which headlines are most effective in bringing readers to your page who find your content relevant. No one wants to add a platform if it’s a hassle to use. Medium’s WYSIWYG editor shows what an article will look like to readers as you compose. There’s no clicking the “preview” button over and over until it looks the way you want it. A simple toolbar allows you to embed content or add design features, and advanced design features give companies tons of options for creating beautiful posts. Given its ease of use, unique metrics, and potential for reaching new audiences, Medium is a creative way to build your brand authority and foster trust with potential customers.